The importance of intangible capital is growing and so is the significance of intellectual property, according to some, and in particular in the new economy. Start-ups see intellectual property as an indispensable tool to attract investors and put their innovations onto the market. 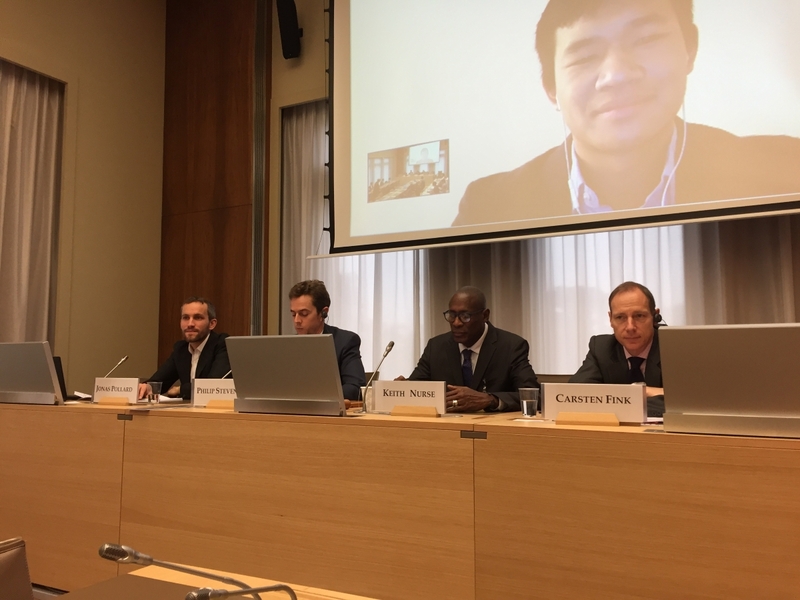 Developing countries still mainly stuck in what some call the “commodity trap” have to identify and exploit their intellectual property assets, according to panellists at an event held at the World Trade Organization yesterday. The event on the societal value of IP in the new economy preceded the autumn meeting of the WTO Council for Trade-Related Aspects of Intellectual Property Rights (TRIPS), taking place on 8-9 November (IPW, WTO/TRIPS, 5 November 2018). The organisers, the Friends of Innovation and Intellectual Property (United States, Switzerland, Japan, Australia, Canada, the European Union, Taiwan, Hong Kong, Russia, Singapore, South Korea, and New Zealand) brought together four panellists: the World Intellectual Property Organization chief economist, two scientists turned start-up entrepreneurs, and an academic expert to discuss the role of IP in development and for start-up companies. Carsten Fink, the WIPO chief economist, mentioned the findings of the 2017 World Intellectual Property Report focusing on intangible capital in global value chains. The report found that about one-third of the global production value comes from intangible capital, he said, adding that the share of intangible capital is about twice the size of the share of tangible capital. The largest returns on intangible capital are found in food products, automobiles, and textiles. In modern market economies, competition leads to continued investment in intangible capital, such as research and development, trademarks, and designs. Companies invest in this intangible capital to keep ahead of their rivals, he said. According to Fink, the IP system plays an important role in dynamic competition as IP rights limit the scope and time of the rights to ensure successful innovators do not rest on their laurels and keep innovating. Keith Nurse, senior fellow at the Sir Arthur Lewis Institute of Social and Economic Studies and the WTO Chair at the University of the West Indies, said the rise of services in the last few decades pulled production away from tangible capital and made IP an increasingly important element of the global economy. He gave the example of the toy industry being disrupted by digital appliances. A giant toy store, Toys R Us, is now in trouble, he said, because kids are playing on their devices as opposed to having more and more toys. Nurse said people who generate IP are the richest on the planet, and countries faring better are those able to exploit the value of intellectual capital as opposed to the material economy. Developing countries are still trapped in a commodity trap, exporting basic or raw materials and not exploiting the IP in those materials. Trinidad and Tobago, his country, produced one of the best cocoas in the world but all the value added and IP are generated in Switzerland, he said, adding that developing countries should mimic what Switzerland has achieved. Fink said the Swiss chocolate industry has a lot to do with innovation. Lindt, Cailler or Nestlé were innovators who filed patents on inventions which led to the texture of chocolate as we know it today. The Swiss chocolate industry keeps innovating, he added. Jason Kang, CEO of Kinnos, 2018 USPTO Patent for Humanity award recipient, explained Kinnos’ patented invention. In the context of the Ebola crisis, one of the most important issues was the poor application of disinfectant, where a number of spots were missed, and lack of compliance, where people did not wait long enough for the disinfectant to have killed all bacteria. Kang and Kinnos’ co-founders created a patented coloured additive which turns the disinfectant blue. The colour subsequently disappears when the disinfectant has achieved its goal. The inventors found that beyond the immediate impact of better disinfection and compliance, the product also brought tangible impact on the lives of health care personnel in countries they visited, Liberia and Guinea. Despite risking their lives to carry out their duties, those people were often shunned by the community for fear of contagion. Kinnos’ invention eased that state of things by making people feel safer. Another added benefit of the invention was that the additive makes the disinfectant more adherent and reduces its deleterious side effects for patients and health care workers. Beyond its use in emergency settings, the technology is applicable everywhere and particularly interesting in the context of nosocomial infections, he said. According to Kang, up to 7 to 10 percent of patients in health care facilities end up getting an infection from the hospital or the clinic in the United States. The inventors are working on an adaptation of the technology to be used in hospitals and clinics, he said. Jonas Pollard of Hemolytics, a start-up based in Switzerland, said the company is developing a new malaria diagnostic. In malaria endemic areas, where measures have been taken to treat most patients, some of them go undetected because they are free of symptoms but remain a reservoir for the parasite. The entire population needs to be screened to find the parasite carriers, he said. The diagnostic kit has to be highly sensitive, robust, unexpansive, and portable and none fit the profile for the moment, according to Pollard. Hemolytics has patented a malaria biomarker and is currently conducting a pilot study in Brazil. Pollard said patenting the invention really helped gather funds and develop Hemolytics’ venture. Intangible capital is the easiest asset that can be acquired at the beginning, he said. A patent grants credibility and makes it easier to raise money, he said, adding that IP is key for a start-up to grow. The remaining question is where to patent the invention, according to Pollard, given the cost of filing patents and of maintaining them. In the case of Hemolytics, the technology requires a lot of knowhow, he said, and it would probably be easier to get a licence from Hemolytics than trying to reverse engineer the invention. Kang concurred on the difficulty of choosing in which country the invention should be patented. According to Kang, the inventors decided to file a provisional application but said the amount needed to file an initial patent application are prohibitive for most start-ups, and constitutes a barrier to entry. Whether the company has patented its invention is the first question asked by investors, he said, and a patent is key for partnering or licensing. He however said there is a fine line between bringing enough claims in the patent application, and at the same time not being too specific so as not to disclose too much so people cannot find a way around the patent and reserve engineer, he said. According to Fink, middle-income countries have managed to integrate in the global value chain, particularly China. Some 20 years ago, China’s participation in the global value chain was partly its ability to manufacture at low wages, he said, adding that this is increasingly changing and China is now accumulating intangible capital. Taking the example of coffee, Fink said coffee is mostly grown in the developing world, and branding and reputation are becoming more and more important for exporters, which then can have premiums on intangible capital. Nurse said there are different ways to measure the creative sector in countries. WIPO calculates the value of the copyright industry and its impact on the gross domestic product (GDP), he said. Based on WIPO’s surveys, he explained, for the US economy, it is estimated that copyright industry represents 11 percent of GDP, more than aerospace, agriculture, manufacturing, and pharmaceuticals. It is only increasing with companies such as Facebook, Amazon, Alphabet, Netflix, Google, and Spotify. They are trading mostly copyright-related content, he said. In Nigeria with Nollywood, and India with Bollywood, the part of the copyright industry in GDP is between 7 or 8 percent, while the average in other developing countries is about 5 percent, he said. “The challenge for most developing countries is when you start looking at the trade dimension,” he said. China exports the most creative goods “by a huge margin,” he said. From 2013-2015, China exported US$60 billion of creative content and only imported US$5 billion, he noted. However, main net exporters of IP are the developed economies while most developing countries are net importers, and they have to “reinvent their economies to tap in those opportunities,” he said. “The IP construction is the key issue that countries need to be thinking about,” he said’;[, adding that developing countries should be encouraged to identify their IP assets. "Intangible Capital Rising, IP Key For Start-Ups, Traditional Growth Model Has To Change, Panellists Say" by Intellectual Property Watch is licensed under a Creative Commons Attribution-NonCommercial-ShareAlike 4.0 International License.